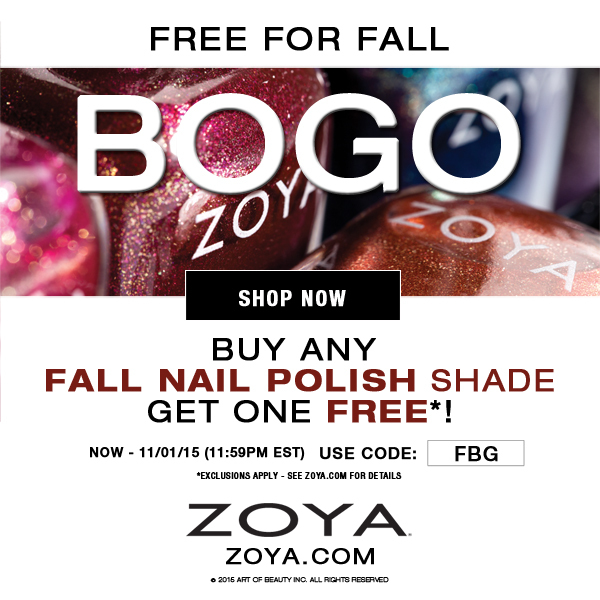 Never Enough Nails: Zoya Fall BOGO!! Buy Any Fall Nail Polish Shade Get One FREE*! 2. Enter code FBG into the coupon code field and press "Apply Code". Valid for items on the Fall Nail Polish page at www.zoya.com through 11/01/15 (11:59pm EST). Not valid in conjunction with other coupons, codes or promotions. Shipping & Handling fees apply. Continental US & Canada ONLY. Free items valid on open stock nail polish bottles only for equal or lesser value. Excludes Zoya Nail Treatments and Naked Manicure Products. Art of Beauty is not responsible for incorrect addresses, credit card entry errors, web related issues or any errors associated with declined credit cards. Returns or exchanges of promotional items not permitted. Code must be entered at time of purchase - code cannot be reinstated for canceled orders. One code per account. Please allow up to 4 weeks for processing if volume warrants it. Zoya Nail Polish is the world's leading brand of nail polish. Known as the "Healthy New Color of Fashion" Zoya is always a step ahead of fashion trend with the longest wearing natural nail formula. From creams, mattes, satins, metallic and texture finishes there are over 300 shades to choose from at www.zoya.com.